Disney Animation: The Illusion of Life is a book by Frank Thomas and Ollie Johnston, two Disney Legends of animation counted among the famous group of Walt Disney’s Nine Old Men. The book topped the list of “best animation books of all time” in a poll at AWN, and is still used as a reference for inspiration on character animation. I have this book and can’t recommend it highly enough for anyone who wants to better understand the animation process. After reading it, my own drawing skills improved noticeably! During the interview, Carson mentions that they are almost unknown, despite the fact that they had worked on some of the most famous animated films of all time. They replied that they liked it that way! They mentioned that when they would sit in a theatre to watch their films with children, they would almost die. Why? Because children could be so cruel! No wonder they preferred to hide back in the studio. Carson asked about the rumors that Walt Disney was a cold man and hard to work for, among other things. Both men answered that he was all of those things. However, they clarified that it was also a great pleasure to work for Walt because he was so inspiring, albeit awfully tough! Perfection was expected at all times. It was great to see these Disney Legends chat about their passion for animation. But it almost wasn’t to be! Frank wanted to be a landscape artist and Ollie was heading towards a career in magazine illustration. But Disney put out a casting call and both answered, arriving at the studio to become lowly In-betweeners before rising in the ranks to full-fledged animators. Look to the left in the above picture and you’ll notice another Disney Alumni, Suzanne Pleshette (January 31, 1937 – January 19, 2008). You may remember her for her roles in The Ugly Dachshund, Blackbeard’s Ghost, and The Shaggy D.A. Also, if you look to the far right in the above picture, you can see Carson holding up the book in question (blurry though it is). Hello, and welcome to this week’s Disney Trivia post! I’m joined by my friends Heidi from Heidi’s Head and Jodi from Magical Mouse Schoolhouse, and this month I’m focusing on some great trivia related to the collection of animators known as Walt’s Nine Old Men. Today we are talking about Les Clark, the first of Walt’s Nine Old Men. 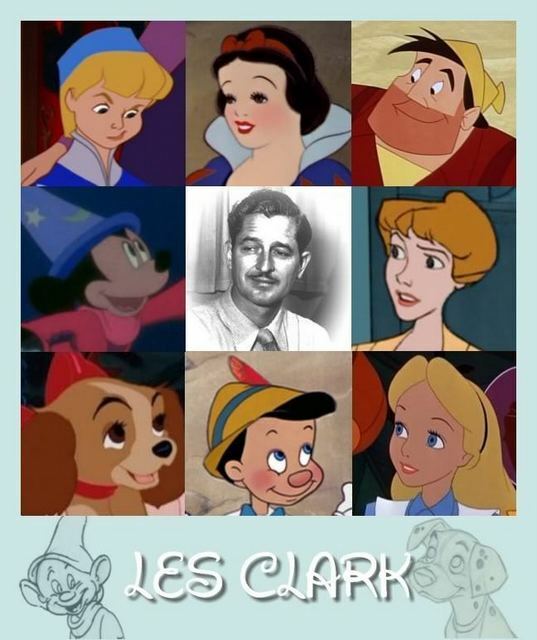 Did you know…that Les Clark was hired by Walt Disney just days after he graduated from high school? Les started work on February 23, 1927, in what Walt warned “might be a temporary job”. Well, that “temporary job” lasted until Les retired from Walt Disney Productions on September 30, 1975 — the longest continuously employed member of Walt Disney Productions! The image above shows some of the characters that Les Clark worked on during his career at Disney — and Les Clark was also the only of Walt’s Nine Old Men that did any work in the early days of Mickey Mouse! Thank you for stopping by today, now, please check out the rest of the entries for this week! This box set of nine flip books pays tribute to Walt Disney’s original animators–the Nine Old Men: Les Clark, Eric Larson, Frank Thomas, John Lounsbery, Ward Kimball, Ollie Johnston, Mark Davis, Wolfgang Reitherman, and Milt Kahl. Each flip book features an iconic scene from an animated Disney feature in its original line-drawn form, having been selected from among a wide range of films for great movement and classic characters. The films include Alice In Wonderland, Dumbo, Fantasia, Peter Pan, Bambi, Lady and the Tramp, 101 Dalmatians, and Pinocchio. Such iconic clips from the reel of Disney animation history include: Lady and the Tramp’s moonlit spaghetti dinner; Sorcerer Mickey’s ordeal with a horde of mops; and Thumper’s announcement that a prince has been born! This is a different kind of book set. It doesn’t take more than a few minutes to flip through the nine books and to catch a glimpse of what an animator sees when proofing his work. But it’s a few minutes well spent! Pete Docter obviously put a lot of love into this publishing project and it shows. The introductory booklet provides a wonderful insight into each of the nine men featured along with a ‘remembrance’ from a modern animator currently working for Disney. We’ve all heard of Walt Disney’s nine old men, but now we can really get to know them! Docter concludes the booklet with a section describing The Animation Process. Again, this is a very special book set, and as such won’t appeal to everyone. For the Disney or animation fan, it will be a welcome addition to any existing library. But it doesn’t take long to flip through it, literally, and so some may question the value at $60.00 US. I would give this release a 4 out of 5 stars, mainly because of the value issue for the general public. And even many Disney readers may end up looking at it once and rarely again. But for the Disney fan, obviously it will rate higher! I’d like to thank Disney Publishing Worldwide for sending me this preview copy.